Editor's note: Our guest blogger today is Majid Manzarpour, Founder and CTO of Synergyse, a company that provides training solutions for Google Apps. See what other customers that have Gone Google have to say. And learn more about Synergyse on our Cloud Platform Blog. Synergyse is on a mission to teach the world how to use Google Apps. 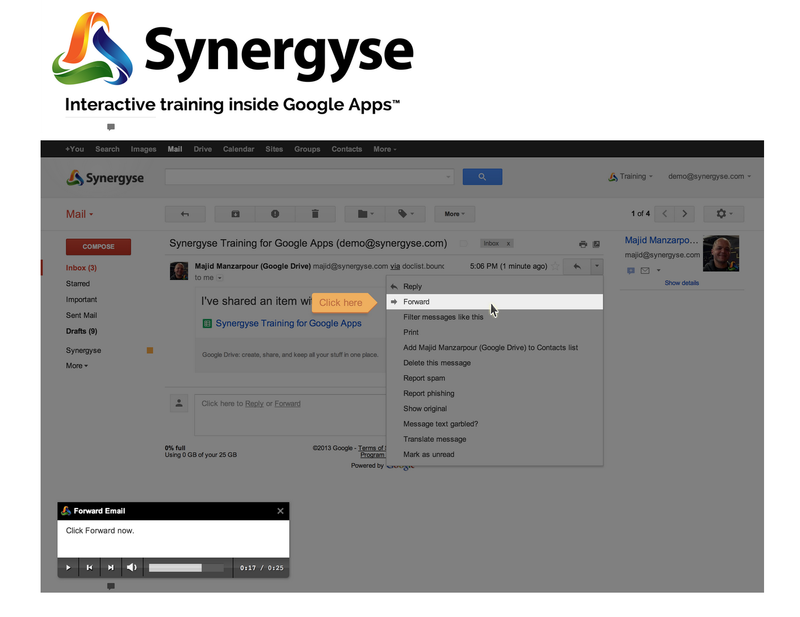 We built Synergyse Training for Google Apps, a fully interactive, measurable and scalable training solution that has been deployed throughout organizations and educational institutions globally. There are new features introduced to Google Apps on a regular basis, and we take extra care to keep our customers educated whenever any product updates happen. Our solution provides in-application training that delivers lessons with audio and visual guides in your existing Google Apps account, allowing you to remain in your applications, learning how to use them simultaneously. We aimed to build a solution that could deliver the same level of scalability, security and reliability that more than 5 million businesses have known to expect from Google Apps. In order to make sure our training software could run seamlessly, we chose Google Cloud Platform to support our backend. We run on Google App Engine, and can automatically scale up to accommodate organizations of any size, anywhere in the world. Google Cloud Storage and Google Cloud SQL handle all of our data needs and provide cost-effective integration with App Engine. We can rely on the 99.95% uptime delivered by App Engine to ensure our customers have training available when they need it. When we deliver automatic training updates for new applications and features to our clients, they can trust us to provide the same level of security that they find with Google Apps. The Google Cloud Platform is powered by the same Google data centers that power Google Apps; it takes care of our backend infrastructure and enables us to focus on our product. We chose to develop our solution as a Chrome Extension because we can deeply integrate with Google Apps through the browser, as well as provide IT administrators with rapid software deployment options. This allows us to layer our interactive training on top of real Google Apps and provide automatic software updates. With the Chrome Management console, the extension can be deployed to an entire fleet of Chrome browsers and Chromebooks with a few simple clicks. When we went live with our first enterprise client, we were both impressed with how effortlessly our software deployed to the entire organization and scaled up to support them. By choosing Google Cloud Platform and Chrome, we can focus on providing scalability, security and reliability to our clients who have chosen to run their organizations on Google Apps.